Arguably the world’s most famous notebook brand, this Italian design-led company is a destination brand that is eagerly sought out by savvy consumers. Moleskine now creates an entire family of nomadic objects; Objects that follow us everywhere we go and identify us wherever we are in the world. Moleskine objects are partners for the creative and imaginative professions of our time. They represent, around the world, a symbol of contemporary nomadism. Moleskine create legendary notebooks, with a focus on inspiring journeys — personal and creative. Other notebook ranges include Moleskine Chapters, Moleskine Contrast and smart notebooks, like the Moleskine Evernote series and the Moleskine Adobe Creative Cloud Connected notebooks. The traditional Moleskine hard cover notebooks are available in various sizes for every purpose. Always at the ready, these sturdy thread-bound notebooks capture your thoughts, drafts, sketches, notes, appointments and contacts. Available in black, seasonal colours and limited edition releases. These notebooks are especially designed for everyday professional life with pages for meetings, project-planning, to-do lists, in-depth notes, key subjects, action points and next steps. Available in A4 and Extra large sizes, these notebooks come in black and a range of colours. Slim, soft and light journals for all occasions — to make notes on the fly, to fire thoughts. They feature a substantial yet flexible cardboard cover, acid-free paper, and visible thread-bound stitching on the spine. They are thinner than hard-cover Moleskine notebooks and are packaged in sets of three, with the last 16 sheets of each cahier detachable. 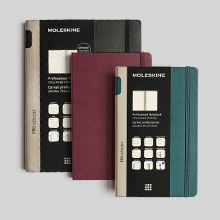 The Moleskine Volant notebook with their soft covers, come packed in sets of two consisting of two different shades of the same colour except in black. The acid free paper pages are thread-bound and the detachable sheets are perfect for loose notes. Hard and soft cover diaries, in a tight range of colours and page layouts, is offered by Moleskine in the 18 month format. Commencing 1 July in any year, these diaries offer exceptional value and are the ideal means of staying organised for longer. One of Australia’s most popular diary ranges is the 12 month Moleskine diary. Released with many size and layout variations for all tastes and organisational styles, this diary always comes in classics like black and red but introduces seasonal colours annually. The design for these phone cases takes its inspiration from the classic Moleskine notebook. The cases are sturdy, stylish and have wide appeal across the market. Available for iPhone 6 and 7 styles. Every year Moleskine releases notebooks and diaries with some of popular culture’s favourite icons. The artwork, however, is always with Moleskine’s unique touch and approach. The Moleskine brand continues to grow, devoted to creating objects that contribute to culture, travel, memory, imagination, and personal identity. Telegram Co. is the official, exclusive distributor for Moleskine in Australia and New Zealand. Interested in stocking Moleskine? Please complete our retail partnership enquiry form. (Just wanting to buy something for yourself? Shop online at Milligram.com (formerly NoteMaker).